Dramatic differences in chimp societies, discovered by researchers at the University of St Andrews, reveal variations in social status and sharing food, as seen in human cultures. The study, published in PLOS ONE found that two chimpanzee communities in Uganda had strikingly different attitudes to hunting and how they shared meat. 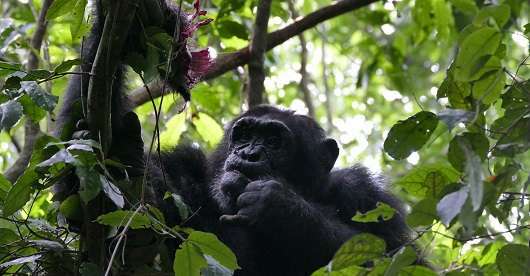 Scientists from the University of St Andrews, University of Neuchatel and the Max Planck Institute in Leipzig used 27 years of observations to study the hunting behaviour of two neighbouring chimpanzee communities in the Budongo Forest, Uganda. Dr Catherine Hobaiter, lead author, said: "The differences in hunting between these communities are dramatic – so we wanted to try to understand why. They live in the same forest and have access to the same prey, but they hunt for different species and seem to share food differently." The Sonso community, studied for 27 years, prefers to hunt for black and white colobus monkeys. After catching a monkey the high-ranking males take possession of the carcass, even when they weren't the ones to catch it. Other group members then beg for access to the food, which is sometimes shared. The Waibira community, studied for six years, currently prefers to hunt for duiker – a type of small antelope – especially red duiker, a species the Sonso chimpanzees have never been seen to hunt. Waibira also hunt for several other species, including monkeys. After catching prey, lower-ranking group members, even young females, are able to take and keep possession of the carcass. The researchers suggest that some differences between the groups, such as the hunting of red duiker, may just reflect a preference for different types of food. Other differences may represent variation in social behaviour. Dr Hobaiter added: "One of the most remarkable differences we see is in how the groups share meat. In Sonso it is rank based – the most dominant chimp gets the meat, even if he wasn't the one that caught it. In Waibira we sometimes see younger individuals, even young females, keep the whole carcass and even if it's the alpha male who arrives, she'll refuse to share it." Further differences may be due to the impact that acclimatization to human presence has on the chimpanzees. The types of prey hunted in Waibira today are similar to those recorded in the early years of research in the Sonso community. Regular colobus hunting only emerged in Sonso after around 15 years of research; a similar pattern has been recorded at other long-term sites where chimpanzees switched to regular colobus hunting after many years of observation. Dr Hobaiter concluded: "Long-term research with wild chimpanzees brings real conservation benefits, but we have to remember that our presence can affect their behaviour; in this case the group hunting used to catch colobus monkeys may take years to re-establish." Chimpanzees are widely considered the most 'cultural' species of non-human animals. This study emphasizes that cultural, social, environmental and human factors all contribute to the differences we see between chimpanzee communities today.